Hello. My name is Rachael. I am happy to be the newest volunteer here at The Save Lucy Campaign. I am a 6th grade student, but because I am not old enough to work with the bats, I will be writing Lucy’s blog. Since Lucy is a bat, she can’t do it on her own! I hope she’s happy with the job I do for her. I will try to write something every week for the “Baturday News”. I’ll be writing about the bats that visit my house every year and interesting bat facts. I hope that everyone who reads my blog learns about bats and how wonderful they are and how they need our help to survive. Since the bats aren’t here yet, I’ll keep you informed of interesting bat facts that I learn while talking to the people here at The Save Lucy Campaign. My first interesting fact is about how many different kinds of bats there are. According to the International Union for the Conservation of Nature, there are 5,488 different mammal species. There are about 1,200 species of bats. This means that just over 1/5 of all the mammal species in the world are bats! Some of them are very tiny and are only about an inch long and some of them are HUGE and have wingspans of more than 4 feet long. Most bats are pretty small. Most of the bats in the world eat insects, some eat fruit and some eat other things like fish. Yes, I know that vampire bats are huge, scary, drink blood and swoop down out of nowhere in the MOVIES! But, there are only 3 kinds of vampire bats and they rarely drink human blood and they are about the same size as a mouse. The next time you see a bat, think about all the bugs it’s eating. They are really very helpful and interesting creatures. Next week‘s topic…Turn off the Lights!!! Next StoryTurn off the lights!! What a great blog and what interesting facts you gave! You are an excellent writer! When do you expect the bats to move back in? I will be following your weekly blog, keep up the great work for bats!! 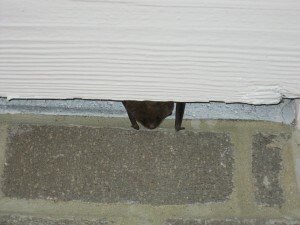 The bats living on my house are big brown bats. Jean T–You’re an extraordinary young lady. I really enjoyed your Baturday news and will look forward to it every week. Paula R– Hi Rachel, nice to meet you! 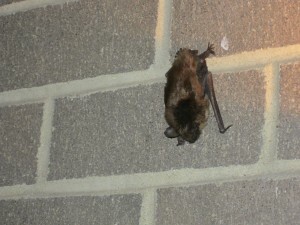 do you know what kind of bat that is, living on your house? The bats usually move in during October. Last year they got here on Halloween. I have read all most the whole blog!